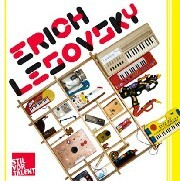 Erich Lesovsky is the newest addition to Stil vor Talent’s exciting artist roster. Here comes someone who is totally fascinated and absorbed by technology, someone who only performs as a live act in the clubs and - in the time of digital machinery - still works on constructing his own devices to make music with. After singles for WBA and Keno records, it is now the time for his first release on Oliver Koletzki’s Stil vor Talent imprint and Mr. Lesovsky is very happy to be part of the family. So are we, of course! Not only, but also because his first EP is a killer display of musical wizardry. It stars off with “Bell A Donna", a minimal funk-laden piece of music that is mainly based on some crisp beats, many warm effects and sounds and a melody so simple, yet so encapsulating to capture the heart of every dancer in the club. This is oldskool minimal funk at its best! Next up is “93 percent", a title that might be misleading at first, because this track sounds more like 150 percent really. A great loop made of fidgety techno hi-hats and some wonderful warm analogue sounds - this could well be termed a new form of fidget techno. Last up is “Riot Beatz", an experimental display of minimal sound design, yet still very danceable. Lots of crystal bashing beats, a pumping bass and many little effects - this will definitely be one for the dancefloor in the morning hours. Not only does E. Lesovsky seem a master of sound, his expertise seems to cover the perfect creation of warm, yet basic tech anthems and his influences seem to come from all sorts of musical directions, from hip-hop to funk to house back to techno. It is the easiness with which he delivers his music that makes his sound designs so special!